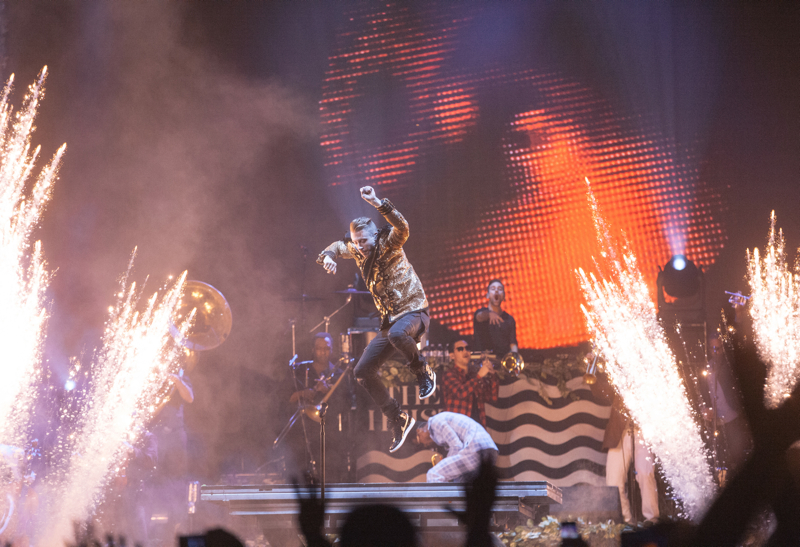 Seattle-based hip hop artists Macklemore and Ryan Lewis may be the biggest mainstream success story in 2013, and for good reason. In addition to independently releasing their debut album, The Heist, the duo have spent the majority of the last 13 months racking up chart-topping single after chart-topping single, traveling the world on their largest tour yet, and most recently, celebrated seven Grammy nominations. So it’s no wonder Thursday’s show at the Key Arena in Seattle – the final stop on the tour, and the third of three consecutive sold out nights at the venue – was a celebration of sorts. An elaborate welcome back to the town’s hometown heroes. In truth, there were several moments at the duo’s finale show that could have been deemed the quintessential “Seattle moment.” It could have been when the giant black and white Heist flag dropped from the rafters at the start of the night and was met with shrill screams. Or later, when the rapper explained that their the first artists to successfully sell out three nights at that venue – ever (met with more screams). Or later still, when Macklemore took the stage in a retro Sonics jersey – and talked about hamming it up with Seattle legend Gary Payton and soon-to-be another Seattle legend, the Seahawks’ Russell Wilson. But for those who’ve been listening to Macklemore and Ryan Lewis since before “Thrift Shop” made them household names, it was the moment the duo began “My Oh My” – a touching tribute to the late, great Hall of Fame sports announcer Dave Neihaus. As the screen behind the performers flashed clips of the infamous double hit by the Mariners’ Edgar Martínez in Game Five of the 1995 American League Division Series with the Yankees, real cheers erupted throughout the room. 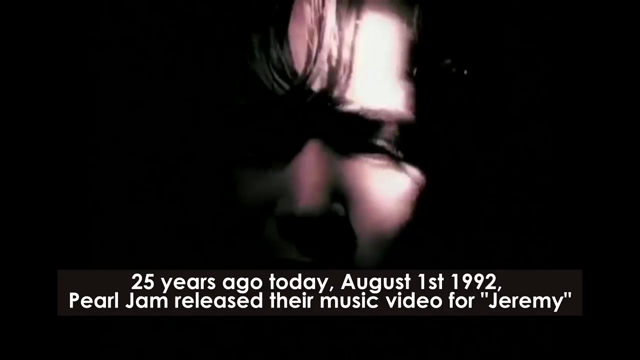 For those five minutes of raw, kinetic connection, it seemed to be 1995 all over again – in the best way. 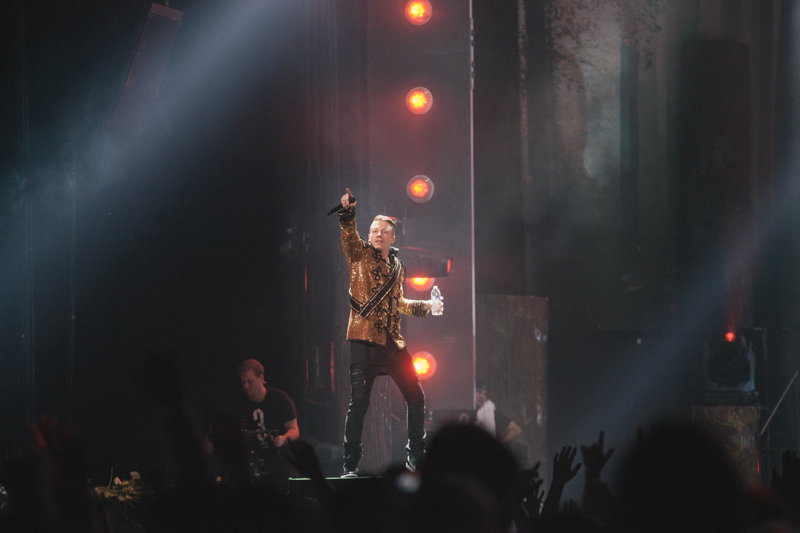 Fact: Macklemore shows are always a spectacle – the big music, bigger dance numbers and even bigger stories – and Thursday’s show was no exception. If anything, it was bigger and better and more elaborate than ever before (the perks of a larger tour budget provided for more confetti, more show-y lights and an endless supply of balloons falling from the sky.) Paired with electric performances of tracks like “Thrift Shop”, “Can’t Hold Us”, and fan favorite “And We Danced” – and featuring live instrumentation including cello, violin and brass – these theoretical (and literal) pyrotechnics were fully realized. 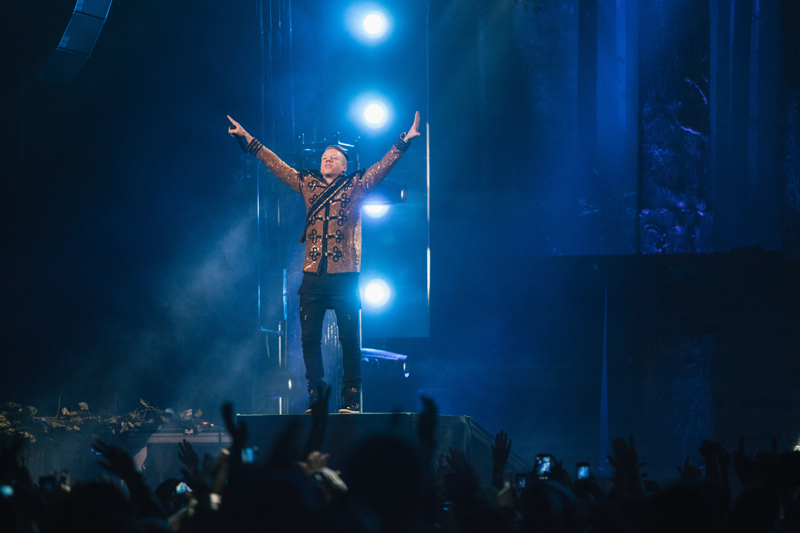 Macklemore is a preacher of the people, and true to that, some of the most impactful moments of the 90-minute set were the more reflective ones – the minutes between songs in which the rapper – born Ben Haggerty – shared stories of his musical beginnings: growing up in Seattle, falling in love with hip hop (and later alcohol and drugs) and his constant battle to stay sober. Regarding the latter, the singer performed a chilling a capella version of “Otherside”, a pre-Heist track that documents Haggerty’s unwinding and subsequent return from the dark. The follow-up, a relapse ballad entitled “Starting Over” (off The Heist), brought the reality of his struggle full circle – and highlighted the fact, that even on the cusp of success, he almost lost it all again. Another significant moment came when the rapper took a break from the set to acknowledge the great progress America has made in regard to equal rights. 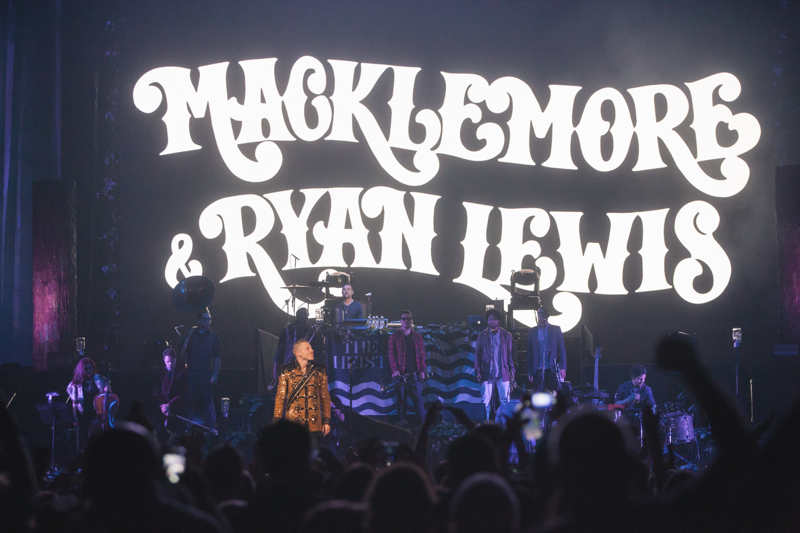 As Macklemore and Lewis praised the crowd in Washington state for leading the sea of change, the opening notes of “Same Love” began. By the time Mary Lambert joined the duo and the rest of the band on stage to sing the the hook, a sea of cell phones filled the arena with light, further highlighting the tears flowing from eyes all over the room. The celebration regained momentum toward the end of the set, when the duo paid tribute to the city once again with “The Town” and “Cowboy Boots” – the former of which serves a pseudo-history of Seattle’s hip hop scene, and the latter being a nod to Seattle’s ever-exuberant Capitol Hill neighborhood. When the the duo and their band returned to the stage for a rowdy encore, the level of local love seemed to reach new heights, and following an extended thank you to the cast and crew, Mack invited his family to the stage for an explosive reprise of “Can’t Hold Us”. Cue one more opportunity for pure, uninterrupted joy. As the final pieces of confetti fell to the floor and the sweaty, dancing bodies finally began to file out, the reality of the past year – the importance of this three night finale – was clear: They came, they saw, they conquered. Now they’re home – and we couldn’t be more excited to have them back. Catch more photos from Allyce Andrew at her official site.